Published today, the British Business Bank’s fourth annual Small Business Equity Tracker report reveals the UK equity finance market for smaller businesses has bounced back to record highs in 2017, following a decline in 2016. 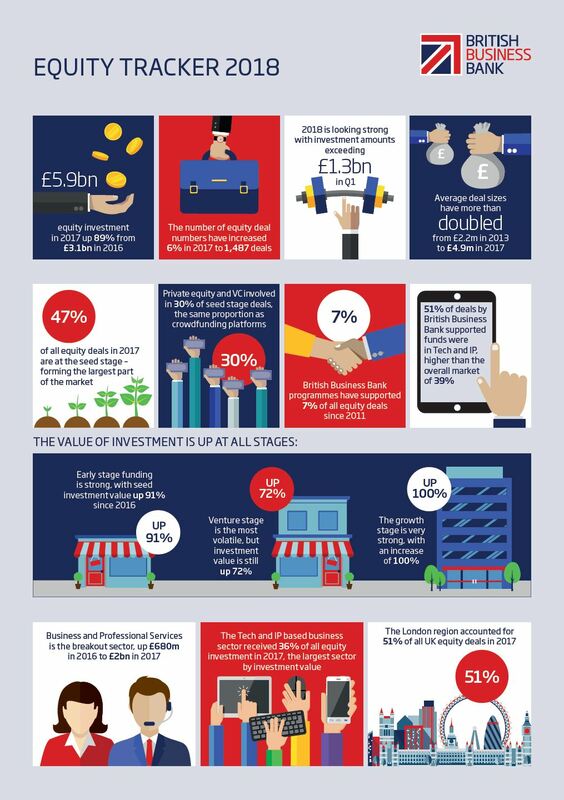 The report, which provides an in-depth assessment of equity finance markets for growing businesses, found total investment value soared in 2017 by 89% to £5.9bn, with the number of equity deals increasing by six per cent. This represents a 50% increase from the previous peak in 2015, signalling signs of investor confidence. Deal sizes have increased across the whole market, with especially pronounced increases amongst the largest deals. The London region accounted for over half (51%) of all UK equity deals in 2017, followed by the South East (10% of deals), Scotland (8%), the East of England (6%), the South West (6%), and the North West (6%). There are clusters of strong deal activity developing around the country including in Edinburgh, Manchester, Bristol, Glasgow and the established equity eco-systems around Oxford and Cambridge. The British Business Bank is establishing a new commercial programme to support developing clusters of business angels outside of London, and will increase its physical presence across the UK by leveraging regional angel groups and a network of regional relationship managers to support this. Equity investment in the technology and intellectual property sectors grew to a record high of £2.1bn in 2017. There was a large increase in equity investment in business and professional services– up from £680m in 2016 to £2bn in 2017. Average equity deal sizes have increased over the last few years from £2.2m in 2013 to £4.9m in 2017. The ten largest equity deals in 2017, were equal to £1.7bn and formed 28% of the market. The seed stage – which makes up nearly half the market by number of deals (47%) – has seen an increase in investment value of 91% compared to 2016. The growth stage has seen the strongest increase in value – rising 100% compared to 2016. Keith Morgan, CEO, British Business Bank, said: “After a weaker 2016 the UK’s SME equity finance market saw a record year of growth in 2017 with investment amounts soaring to £5.9bn. This is a clear sign of investor confidence in British smaller businesses and their potential for growth. British Business Bank equity programmes are estimated to have supported around 7% of all equity deals between 2011 and 2017, accounting for around 10% of the overall invested equity amount. The Bank is the largest UK-based LP investing in UK Venture Capital. The Bank received additional funding at the 2017 Autumn Budget to increase the amount of patient capital to support UK smaller businesses looking to scale-up and realise their growth potential. We have launched a new £2.5bn Patient Capital programme to invest commercially into venture and growth capital funds and evergreen vehicles. British Patient Capital will invest alongside the private sector, to support £7.5bn of investment to British businesses. British Patient Capital has been established as a separate subsidiary of the commercial arm of the British Business Bank with a view to future sale into the private sector with an established portfolio and proven track record. Our Enterprise Capital Funds programme, which aims to increase the supply of equity and lower barriers of entry for fund managers looking to operate in the VC market, now has an investment capacity of over £1bn and has been extended for a 10 years with a further £1bn of funding. British Business Investments – a separate commercial subsidiary of the British Business Bank – has launched a new £500m Managed Funds Programme designed to increase access to longer-term venture and growth capital. In May 2018, British Business Investments issued a ‘Request for Proposals’ for the first phase of these funds (up to £500million). British Business Investments will also launch a new regional Angel programme in September to further help tackle regional imbalances in the availability of equity finance. The Northern Powerhouse Investment Fund (NPIF) is already making a difference to the British Business Bank’s overall geographic deal flow. This is likely to increase going forward, with additional deals in the Midlands as the product funds established as part of the Midlands Engine Investment Fund have begun to make equity investments in 2018. In June 2018, the Bank launched the £40m Cornwall and Isles of Scilly Investment Fund (CIOSIF) aimed at boosting the local economy by providing debt and equity finance to help small, growing businesses across the region.